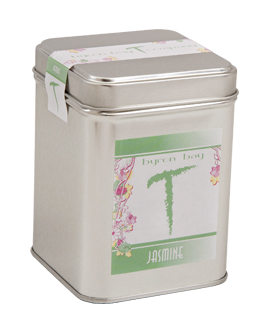 This delicately flavoured jasmine tea features freshly rolled green tea leaves scented with exotic jasmine blossoms. Cool and refreshing, with a beautifully floral scent, this is a favourite among Chinese tea-drinkers. Jasmine teas are among my favorite teas. And what I love most about jasmine teas is the aroma. This Jasmine from Byron Bay Tea Company smells amazing! Before brewing, the dry leaf reminds me of the smell of air. But not just any air… imagine walking through a grassy meadow, and all around you are jasmine vines. Imagine how delightful the air would smell! That’s what this tea smells like in dry form. The brewed liquor takes on a slightly lighter fragrance, but, it is still quite enchanting. And it is so delicious. The green tea is soft – almost like velvet – on the tongue, with a pleasantly fresh taste. I am getting very little astringency here, and no bitterness. Just a lightly sweet taste that unites well with the jasmine notes. The jasmine flavor is in perfect balance with the flavor and texture of the green tea. Soft, delicate, sweet – but not too much of any of these. This jasmine does not have that pungent floral sharpness that so often accompanies jasmine teas. In fact, if I were to choose just one word to describe this tea, the word would be soft. But do not confuse the word “soft” with “lack of flavor” because this tea has flavor! With this tea, when I say “soft” I am talking about silky soft… micro-plush kind of soft. Textural soft. That texture translates so well into the flavor that soft becomes a flavor here. Absolutely delicious! A must try for lovers of jasmine tea!